All of our Heartburn Centers locations offer surgical GERD treatment options which include; the LINX Procedure, Laparoscopic Nissen Fundoplication, and many other sensible options to help with the treatment of chronic heartburn and GERD. Effective, minimally invasive surgical procedures are available. The Heartburn Treatment Center offers the new LINX Reflux Management System. Surgery is an option for the long-term management of GERD. The Heartburn Treatment Center offers the best surgical GERD treatment options that are available. The most common reason these GERD treatments are chosen is failure of available medications to relieve acid reflux symptoms to a patient’s satisfaction. Other reasons may be the inconvenience and cost of taking daily medications, the desirability to actually stop the reflux (which medications cannot do) or drug side effects. The “gold standard” to which all antireflux surgical procedures are compared is the laparoscopic Nissen fundoplication. Its effectiveness has been proven. The “Nissen” is performed under general anesthesia using a slender scope passed through several very small incisions. The Nissen works by restoring the function of the damaged valve (LES) that is the actual cause of acid reflux. This is done by wrapping part of the stomach very loosely around the lower esophagus at the location of the LES. The procedure takes approximately 1-2 hours. The hospital stay is usually overnight and most are back to regular “every day” activities within 1-2 weeks. The reflux is stopped in 80-85% of patients eliminating the need for medications. That same percentage of patients are satisfied with the procedure after 8-10 years and would have it again. There are some side effects with this procedure, which are discussed in detail with patients by the Heartburn Treatment Center staff. 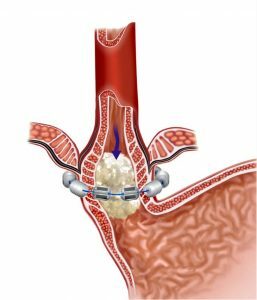 A new surgical GERD treatment available is called the LINX Reflux Management System. The Heartburn Treatment Center was selected as one of the initial centers nationally to offer this surgical GERD treatment. This implantable device is a small bracelet composed of titanium magnets connected by a wire. It is placed around the esophagus at its junction with the stomach. It does not compress the esophagus in any way, but “augments” the defective lower esophageal sphincter. The magnets separate, expanding the bracelet allowing food to pass and then come together again, augmenting the sphincter and its function in preventing reflux. The device is placed using minimally invasive surgical technique, under general anesthesia and the procedure takes approximately 30 minutes. At present, the hospital stay is overnight after which the patient returns home the same day; without diet or activity limitations. In the most recent study, 100 patients who had the procedure were followed for 5 years. 85% were off of all PPI medications and there were no significant side effects. The reflux was stopped in 70% of patients. 91% would undergo the procedure again and 94% would recommend it to a friend. The LINX revolutionary surgical GERD treatment procedure is available through the Heartburn Treatment Center as one of the select, exclusive centers chosen to offer it. There are 2 surgical GERD treatment procedures available that are performed through the mouth without incisions. That is their benefit. They are called TIF (sometimes referred to as Esophyx) and Stretta. TIF attempts to recreate the damaged valve (LES) from inside of the stomach. It seems to reduce medicine requirements in most patients as well as improve symptoms. However, there is no predictable impact on stopping the reflux. Stretta, uses a special type of energy to create “burns” on the inside of the LES. It also reduces medicine requirements and improves symptoms in most patients and has no predictable ability in stopping the reflux. The staff at the Heartburn Treatment center can inform you about the pros and cons of each procedure as you evaluate the surgical alternatives. Surgery is an alternative to medicines in the management of GERD. The Heartburn Treatment Center will assist in the understanding of each option and work with you such that a very informed decision can be made. Today, make that decision to contact Dr. Nilesh Patel to learn more about surgical GERD treatment options. Register for your initial FREE Seminar at one of Heartburn treatment Centers, or contact us via email.